Some of the parameters from each of these sets can be assigned to the KARMA sliders and switches of the control surface of your keyboard, enabling you to manipulate the sounds that KARMA is generating in some very sophisticated ways. This general process is called KARMA Real-Time Control (RTC). In "KARMA-speak," the technical term for the collection of parameters that affect the Karrna module (in programs) or modules (up to four in combis and sequencer songs), the GEs that are selected, and the way in which they are mapped across the keyboard and triggered is known as a "Performance." (You will see this term used in the KARMA Software should you have it.) 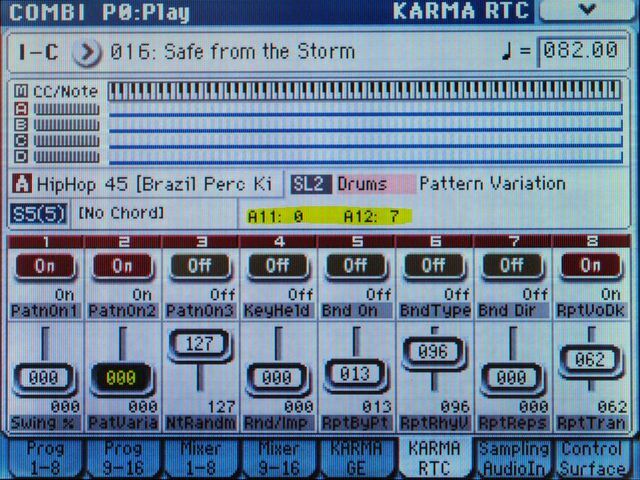 You can look at a program, combi or song setup as consisting of two things: Korg's sound editing parameters, and a KARMA Performance. The KARMA part of a Program is a "Single Module Performance," while the KARMA part of a Combi or Song is a "Multiple Module Performance." You can assign up to 8 of the various Performance Real-Time Parameters (which affect the KARMA Modules) to the switches and sliders of your keyboard's control surface for realtime control while the KARMA module(s) are playing. These assignments are made in the Perf RTP tab of the KARMA setup pages in a program/combi. There is only one set of Perf RTP parameters for a program/combi. When playing a combi, these are usable only when you are in the Master Module Control Layer, and cannot be controlled in realtime if your currently-selected Module Control Layer is A, B, C, or D.
When defining the Perf RTP parameters for a combi, one of the properties you define for each of the 8 parameters is which modules (A-D) this particular parameter will affect (one, several, or all of them). Configure a switch (let's use Switch 4 for this example) to turn the module parameter Note Map Mode on/off only for Module A.
Configure a slider (Slider 8 for this example) to select among a range of values for the module parameter Note Map Table only for Module A. In this case, we'd want to choose among Note Map Tables designed specifically for Drum GEs, so we might assign a range of values from +0001 to +0018. This would make Slider 8 select Global Note Map Tables 01 through 18 (which are all drum-oriented) as you move the slider. With this Perf RTP setup, when Switch 4 in the Master control layer is off, you would hear the default drum notes generated by drum GE in Module A. Slider 8 in the Master control layer would have no effect at all, because Note Map Mode for Module A is currently turned off. If you then turn on Switch 4 in the Master control layer, this turns on Note Map Mode for Module A, so now Slider 8 in the Master control layer will now actually change the drum sounds in the GE-generated drum groove. The notes would be remapped through the Note Map Tables selected by Slider 8. Depending on where you move the slider, the normal kick-snare notes for the GE might become sidestick-ride notes, or different hi-hat notes, etc. You have 32 GE parameters exposed for control in your keyboard (out of more than 400 available GE parameters - see The KARMA in your keyboard is only half the picture). You can change any of the "starting" (default) values of these 32 parameters that will be in effect when you first load up the program or combi. By assigning the KARMA switches and sliders to these 32 parameters, you can subsequently control some or even all of these 32 parameters in realtime. These assignments are made in the GE RTP tab of the KARMA setup pages in a program/combi. There is one set of GE RTP parameters for each KARMA module. Programs have only one KARMA module, but combis (and songs in the sequencer) have 4 KARMA modules. 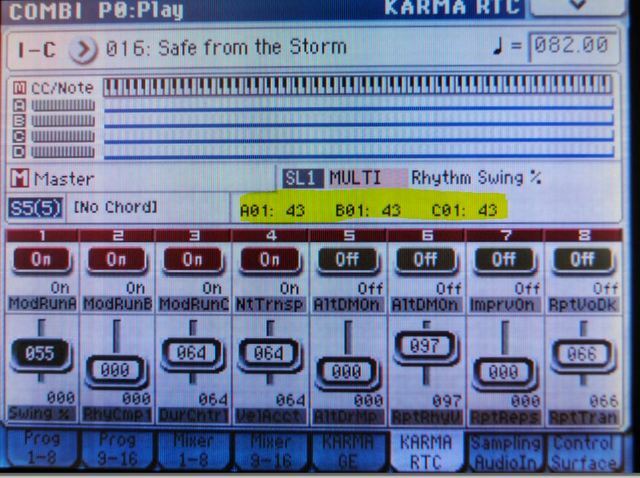 Programs have only one Module Control Layer, so these 32 GE parameters and the 8 module parameters must "share" the 8 available KARMA switches and 8 available KARMA sliders. Combis/Songs have five Module Control Layers, four of which (the A-D layers) are dedicated for use only by the 32 GE parameters for each module. The 8 sliders and 8 switches in the A layer can be assigned one or more of the 32 parameters in the GE for Module A. In other words, any switch or slider can be configured to define value changes for more than one GE parameter at the same time! For example, it could be configured to flip around the direction on the riff (up or down) while at the same time transposing the GE. If you examine the GE RTP tab in the KARMA pages for a few combis, you'll see that this is a commonly-used technique in many of the preset combis. The 8 sliders and 8 switches in the B layer can be similarly assigned to any of the 32 parameters in the GE for Module B. And so on for the C and D layers. When the control surface of your keyboard is set for KARMA Module Control Layer A, then the KARMA switches and sliders are acting only upon the switch/slider assignments made in the GE RTP tab for Module A. And so on for the B, C, and D layers. A slider or switch can control multiple GE RTP within that Module at the same time. For example, it could be configured to flip around the direction on the riff (up or down) while at the same time transposing the GE. Many of the RTC Models have this sort of thing applied to a slider or switch. To view the assigned RTP values for a particular module while moving to the sliders or pressing the switches, go to the KARMA RTC tab and then select the desired module by using the Module Control button on the control surface. As you move a slider the values will change in the KARMA Value Displays portion of the screen, shown in the below image. The 8 sliders and 8 switches in the Master layer of the keyboard's control surface could simultaneously act upon all 8 of the module parameters (Perf RTP) and some or all of the GE RTP for all four modules at the same time. For example, in many combis, Slider 1 is standardized as "Rhythm Swing %", and is assigned to control the swing value of all 4 Modules at the same time. Master Layer sliders and switches can control the same GE RTP that are assigned to the Module Layer. Again, using the Rhythm Swing % example from above, you can use the Master Layer slider to adjust the swing of all 4 Modules at the same time, or you can individually adjust the swing setting for each module by stepping through each Module Control Layer. In a case like this, the last moved setting is what is saved in the Scene. So you could adjust the swing of all 4 modules to 50%, then go to Layer B and adjust only that one Module's swing to 40%, and when that Scene is loaded, the 4 Modules would be at 50% 40% 50% 50%. The way that module parameters are assigned to the Master layer is covered in the previous section. The way that GE parameters from each KARMA module are independently assigned to the Master layer is done via the Master A, Master B, etc. tabs (in the Kronos or OASYS) or via the M A, M B, etc. tabs (in the M3). The GE parameter assignments you make to the switches and sliders in the Module A tab (Kronos or OASYS) or the A tab (M3) can be totally different from the assignments that you make to the switches and sliders in the Master A tab (Kronos or OASYS) or the M A tab (M3). And so on for modules B-D. If you examine the GE RTP tab in the KARMA pages for a few combis, you'll see that this is a commonly-used technique in many of the preset combis. Example showing a Combi's RTC tab with the Master Layer selected. Here Slider 1 is controlling the swing value percentage for Modules A, B and C.